Qayamat Ki Raat is one of a most loving TV serial. The show Qayamat Ki Raat recently entertaining so many viewers. This is one of the most entertaining shows of Star Plus. Qayamat Ki Raat is an Indian supernatural drama television series. The people who love the drama cannot miss today’s episode, because there is a high-voltage drama is there in the serial. In the last episode of the serial Qayamat Ki Raat, we saw that how Raj protect Gauri from Uma and Kalasur. As we all know that Raj loves Gauri more than anything. He thinks that her life is all about the Gauri. On the last episode of 22nd December 2018, we saw that Kalasur said to Uma that you did everything for me, you sacrificed for me, this stone will give me so much power that all will be scared of me………This is all about the yesterday episode of the serial Qayamat Ki Raat. 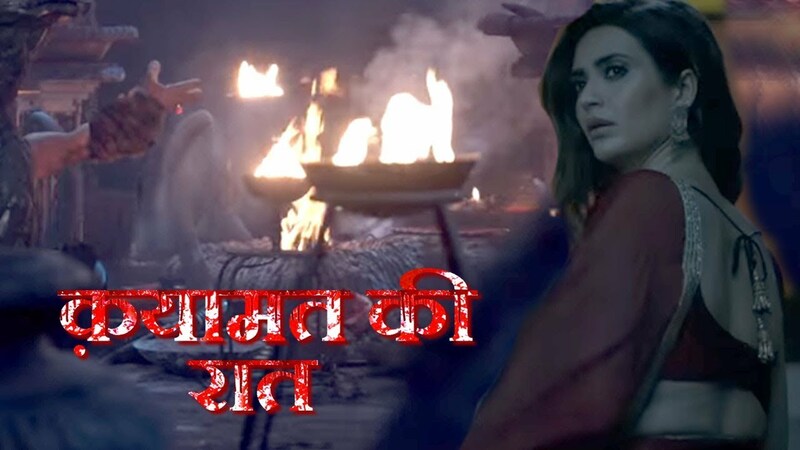 Today’s episode update of the serial Qayamat Ki Raat 23rd December 2018, begins with Gauri hugs Raj. Uma comes to the house of Raj. She recalls all the things that Prithvi said to her. Uma recalls everything that happened in the house. Uma laughs in a very loud voice, to see all this Kalasur also starts laughing with her. Kalasur said you have brought me back, I am so happy because of this. Kalasur said you have given me enough sacrifice. I give you this house and entire Ram Garh. I will sit there in the temple. I will get everything that I wanted. Kalsaur said that the stone will do it everything for me. This magic stone will give me so much power that I will live forever in this world. Meenakshi said now we should run from here. Vikram says we should run from here. Vikram said we can not get to the house. Raj told no Uma knows that address. We should go to the farmhouse. Gauri holds the hand of Raj. she said what are you thinking? Upcoming of the serial Qayamat Ki Raat 6th January 2018, written episode update: Gauri said we will play the one last trick now. He will be trapped in his own game now.